Today’s consumers can be pretty confident that the cash in their pockets or the numbers shown in their bank accounts represent real money, legal tender that businesses anywhere will accept. Not so in the America of the 1800’s. Among the many things that have changed between this day and that was the money that people carried in their wallets. It was printed by private banks instead of by the federal government. Waltham Bank $20 bill. Credit: Library of Congress. But the “private banks” of the 1800’s weren’t exactly the Bank of America’s of today. A lot of these were fly-by-night operations, each with its own currency designs, which meant there were hundreds of different currencies circulating. That made life a lot harder for merchants and a heck of a lot easier for counterfeiters. All this begs the question: how was it possible that such a vast and shady operation was able to survive and thrive outside the reach of the law? Some savvier merchants might have answered that question by pointing to a little book called “A Counterfeit Detector”. This was a book that supposedly listed every single banknote in circulation and explained the difference between good notes and bad ones, letting readers distinguish real money from fake. These explanations, however, tended towards the subjective and unhelpful. Mihm cites the Bank of Utica $3 bill as an example. A Bank of Utica $1 note. Do the horses look suspicious? This problem of counterfeit money got so bad that during this era, as much as 30% of the money in some parts of the country was fake. Today, that number is just a fraction of a percentage point. What happened to trigger such a dramatic change? 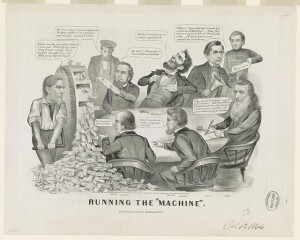 “Running the Machine”- a Civil War era political cartoon highlighting distrust of the government and its “greenback machine.” Credit: Library of Congress. Greenbacks presented a new, promising opportunity for counterfeiters, who could now prey not just on small, state charter banks, but on the federal government itself. The difference was that this “bank” fought back. With a public already skeptical about the new currency, counterfeiting could make the difference between greenbacks’ public failure or acceptance, and thus between the preservation or disunion of the nation. Realizing this, the federal government began a war on counterfeiting even as it battled the Confederacy. Its main weapon against the counterfeiters? An organization that quickly came to be known as the United States Secret Service. Stereograph showing a rather fearsome group of early Secret Service officers seated on a rock by a river. Library of Congress. And crush it did. The Secret Service set a clear boundary between currency that was legal and illegal, a boundary that has survived to this day. So next time you pull out your wallet or your credit card, take a moment to thank the original Secret Service. This is a segment from our episode on the history of deception in American history. You can listen to the whole episode here.